SIP Trunking Cost Savings | 8x8, Inc. Since communication hardware is a major part of any company’s communication strata, the amount of wires and connections that comes with it can be massive. For any business or organization, the presence of a robust communication system is essential. However, the same problems apply to such a setup where a myriad of cables and connection wires are needed to set up communication channels between the company and the world and to establish communication within the infrastructure. The answer to this predicament came in the form of a truly wireless system, Cloud Telephony. Like VoIP (Voice over Internet Protocol), it uses the internet to carry data, freeing equipment from wires and cables. Further simplification of technology was possible by the introduction of SIP (Session Initiation Protocol) Trunking. In essence, SIP Trunking is a form of VoIP that uses IP PBX or Private Branch Exchange to send out and receive calls or data. However, the organization or customer does not need to host PBX servers. The benefits are many, but the most prominent one is cost savings. SIP Trunking cost savings come in the form of reduced hardware requirements and phone bill savings. With SIP Trunking, organizations can access VoIP data transfer without the need for an in-house server or PBX exchange, minimizing the need for hardware requirements and the obstacles that come with it. The transition to less hardware-hungry communication also means less maintenance and more space savings. SIP Trunking cost savings have a prominent effect on the overall business expenditure on a yearly basis and offer the following advantages in the process. Better Call Quality: Sending voice data over the internet makes it less susceptible to analog noise, resulting in a better call quality. Better Scaling: Unlike the wired system, SIP Trunking doesn’t use more hardware to scale as the cloud computing service provider does the processing remotely rather than an in-house setup. More Reliable: With wires and cables out of the equation, there is no case of broken lines, noise or analog attenuation. Since SIP Trunking uses internet and cloud, users can expect to see a giant leap in terms of overall reliably. Elimination of VoIP Gateways: With SIP Trunking, companies are not required to buy or manage VoIP Gateways, as SIP uses IP number to receive calls rather than separate channels. Low Maintenance: SIP Trunking is primarily adapted to replace hardware communication servers or facilitators with intuitive software options. Hence, the need for maintenance and associated costs are greatly condensed. Multimedia Support: Phone systems always had a major disadvantage as they could only transfer voice. With SIP Trunking enabled by cloud, organizations, especially the healthcare sector, can use multimedia features like video calling, conferencing, texts, voicemail, etc. Customer Care: Companies can now opt for 24/7 customer service so that they can offer their customers with the best service strategy. With modern communication methods like SIP, Conventional technologies that use ISDN (Integrated Services Digital Network) standards for simultaneous digital transmission of voice, data and other network services is on the decline. Considering the advantages that any organization would gain using SIP Trunking, this trend is only projected to continue until every industry and home users upgrade towards using VoIP and SIP-enabled VoIP services. Another contribution of SIP towards various industries is the IP PBX. As we discussed earlier, conventional PBX is hardware used to manage data through the communication medium. However, this poses a very big challenge to scaling when the user needs it to, leading towards the purchase of a more capable PBX system. However, IP PBX is an intuitive software rather than mechanical equipment. 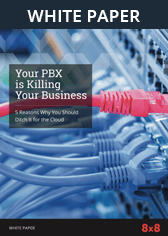 With IP PBX, business organizations can keep on adding the communication device or connections to the network without worrying about hitting a bottleneck. Hence the average cost of SIP Trunk on a yearly basis when considering the cost savings is very low. If you are worried about legacy support and think that a change towards cloud telephony is going to be drastic, then leave your worries here as SIP Trunking also supports porting of old phone numbers to the new system. This allows you and your employees to use their old phone numbers on modern smartphones. However, make sure that you approach a reliable cloud service provider to enjoy these features of SIP Trunking. Choosing the right technology is crucial to a growing business. Take the uncertainty out of the equation by choosing a SIP technology provider that can scale to meet your business' needs whatever they may be at any given time. Call 1-866-879-8647 or fill out an online form to request a no-obligation quote from an 8x8 product specialist.